Acumen Athletics: Leading w/ Power, Pulling back & Doubling. Breakdown of Wanchalong vs Chaisiri. Leading w/ Power, Pulling back & Doubling. Breakdown of Wanchalong vs Chaisiri. If you love comeback KOs this is a must see fight! 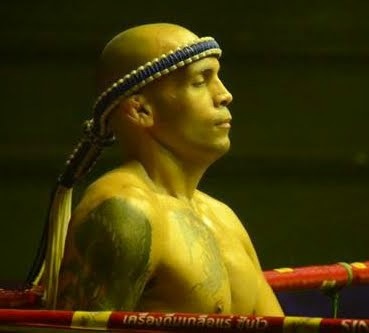 Current lumpinee title holder Wanchalong (red) was set to face current Rajadamnern stadium champ Chaisiri (blue). Watch the full fight below as Chaisiri goes on a quest to become a dual stadium champion. Fighters typically start attacking with their lead side. Since the lead side is closer to their opponent the attacks are a lot faster because it travels less. You will typically see them start off with linear strikes such as as jabs, teeps, switch kicks or switch/step up knees. Leading with the power side might not be as fast as attacking with the leading side, but you will draw a reaction from your opponent in which you can use for setting up other power shots. Blue leads with his rear kick, but red blocks it. Blue quickly adjusts and scores with a powerful cross the moment red recovers from his blocking stance. As red staggers back, blue steps across and lands a well placed left kick to reds face. Fading or pulling back is a great way of avoiding an attack while not losing your foot's position. Since your feet are underneath you, your strikes will have a lot more power when you answer back with a counter. Blue leads with a hook and controls red's lead hand. Blue crowds red in the corner. Red feeling smothered pushes blue, reads the distance and attacks with a rear kick. Blue responds by pulling back and clocking red with a hook from hell. 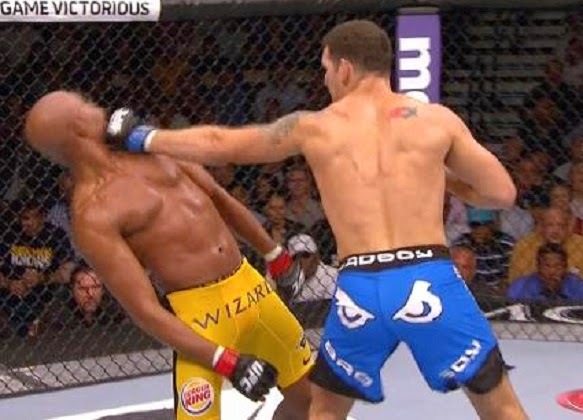 Silva off balance when Weidman broke rhythm & pressed. Just as everything else in life, nothing is ever foolproof. There are some downsides to pulling back, such as getting hit in the body when you thought your opponent was aiming for your head, losing balance when fading too far back (Anderson Silva KO) or getting timed on your return from the pull back. Red launches a rear leg kick. Like Fat Joe's song, "Lean Back" blue does that and avoids the kick. Previously, blue whacked red with a hook. He attempts the same hook. Notice as blue is about to launch the hook he momentarily brings his rear guard hand down. Red, remembering from the last attempt, takes advantage of this open side and bats blue's face with a spinning elbow/forearm (hard to tell from the camera angle). Wanchalong is no stranger to throwing the spinning back fist. He landed one against Eminent Air Gym's NungThep. You can check out that fight video HERE. Thanks to Sherdog's forum member, CocaKillBana, for posting it. Doubling up with the rear side is a good choice for breaking the rhythm while forcefully hitting your opponent with 2 hard shots. You'll commonly see doubling up with the rear when opposite side fighters are facing each other. For example, Pacquiao stamped De La Hoya's face by leading with his cross, even doubling up a few times. Red places a jab to blue's face. Blue retreats in order to create some space. Red follows him and fires a kick that sends blue bouncing off the ropes. As blue ricochets off the ropes, red rebounds his rear leg off the mat and launches a knee that turns blue's liver into a lump of coal. Unfortunate for Chaisiri (blue) this was not his night. His hopes of becoming a dual stadium champ was crushed (along with his liver) by Wanchalong (red). This was a great back and forth match and a must see for fight fans!